Mostly we look at man-made items in these pages, but today I'm showing a series of pictures of a natural location in south-east Queensland. Why? Well, I was struck by the way we mortals treat things of natural beauty. Mostly we commercialise them; sometimes we despoil or deface them; but rarely (in my experience, anyway) do we leave them just as they are. This is one beautiful spot that has been a favourite of mine for many years, and has changed very little in that time. 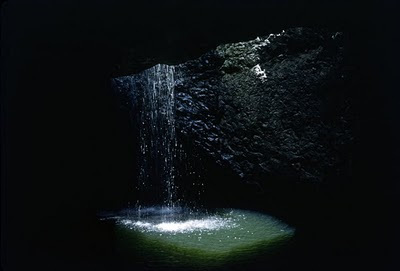 It's in the Springbrook National Park in the Gold Coast hinterland. There's no admission fee, no compulsory bags of food to buy, no shops that charge extraordinary amounts for food and drink. It is certainly beautiful, and it is peaceful too. The first photograph I have is from around 1938. Here is a current photograph from inside the cave. And here is a colour image from 1958. 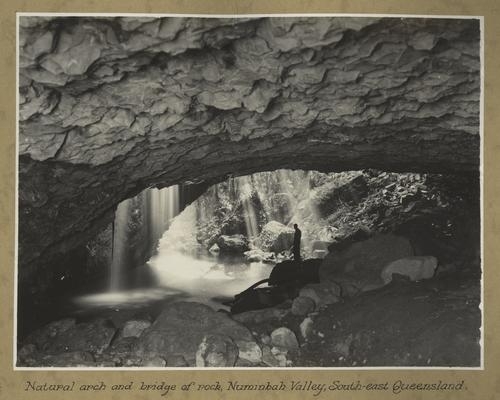 The natural bridge was formed at the lip of an old waterfall, which developed over a hard resistant basalt salt flow. Softer, brecciated (broken up)lava flow or agglomerate beneath the basalt was eroded by the swirling waters of the falls to form the cave behind. Just upstream of the waterfall, a deep pool was scoured in the basalt by the abrasive action of the swirling rocks. Eventually the hole broke through to the cave beneath, allowing the creek to plunge through, and leaving the lip of the waterfall as an arch. The cave has since eroded back further from the foot of the new waterfall. The deposit of silt and stones in the floor of the cave may have resulted from a mudflow in the creek, formed by a landslide upstream. And here is my recent photograph (above), taken using a long exposure with my camera mounted on a tripod. Interesting, isn't it, how we tend to focus on man-made structures. I am quite happy to spend lots of time examining man-made structures other than buildings - well designed gardens, bridges, beach facilities etc are all equally fascinating to me. But show me a lump of rock or a creek going nowhere and my eyes glaze over. Apparently, My great uncle (Hinde - early family in area) once owned the land that the natural arch was on, before it went back to gov hands. I love this area, and not just for family history reasons but because it is just such a naturally beautiful area! Brissiemum2: Keep reading this blog! Any ideas why it is sometimes called the Natural Arch and sometimes Natural Bridge?